Bloomberg recently published an illustrative slideshow titled “The Real Cost of Owning Gold”. As usual when dealing with precious metals, in an attitude that is widespread among the mainstream financial press, the tone is dismissive, disdainful and almost mocking of those that advocate ownership of hard assets – and especially gold. The reasons for this hostility are fairly obvious. First, ignorance: precious metals have been out of fashion for over 30 years, and financial analysts (average age 35) know little about them. Most would have came of age, professionally and intellectually speaking, during the early part of the last decade – at a time when gold investors were the crazy-old uncles of the investment world: deemed irrelevant and backward-looking by fashionable opinion. A large majority of these analysts will have Economics degrees from well-respected universities, where they will have been taught that gold has no role in modern economics. They will then have likely received masters and further financial and accounting qualifications that promote “Modern Portfolio Theory”, and the idea that the investment world starts and ends at splitting money between stocks and bonds – with young investors encouraged to sink most of their capital into stocks, while older wealthier individuals are pushed into the “safety” of bonds. The second and perhaps most important reason for the press’s antipathy towards gold and precious metals are their advertising incentives. Financial institutions, brokers and the financial press simply do not know how to make money from selling, buying or trading gold. In fact funds spent on gold have little turnover and earn few commissions, especially compared to banks’ favoured products. 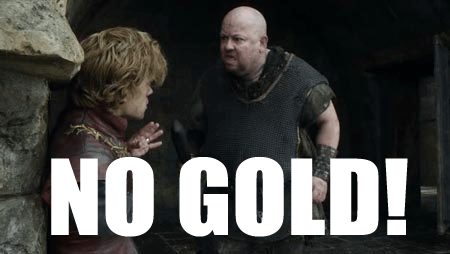 Gold is just too simple. It does not require a PhD to understand, it doesn’t respond to complex valuation models, and it doesn’t generate juicy IPO flow. It just sits there, making portfolio managers and financial advisers almost obsolete. Thirdly, and it is difficult to gauge how significant this factor really is, there is a positive and fierce dislike of gold for ideological reasons. As Alan Greenspan himself recognised in his famous essay Gold and Economic Freedom, those with a disposition towards deficit spending and Keynesian economics find gold a huge obstacle in pursuing their agenda of wealth redistribution and central planning. This antagonism, even if not always conscious, permeates much mainstream economic opinion on gold and is made explicit in the writings of some prominent opinion leaders. A common accusation and one that is repeated in the aforementioned slideshow is that gold investors (or savers) are some kind of cult or religion. The juxtaposition is always between “faith” or “belief” in gold, versus “reasonable” investments. Gold owners are said to suffer from paranoia, or misguided and superstitious “gold fever”. I would contend that the opposite is true. Knowledge of economic history, understanding of counterparty risk, experience of inflation, awareness of systemic risk and how it affects our interconnected global financial systems and a rational desire to protect wealth from all these factors is what eventually leads many investors to gold. The irrational faith is that placed in central banks and fiat currency in spite of overwhelming historical precedent. As James Turk once wrote, it is central banks that are the real barbarous relic, not gold. The Bloomberg presentation does mention some aspects worth considering, such as insurance, transport, storage and appraisal. A gold buyer must consider all of these aspects carefully, but no more than the buyer of any other “hard” asset such as a house or a valuable portrait must. Unlike financial products that are often no more than annotations in an electronic ledger, real stuff needs looking after. Gold is, however, quite a bit easier to store, transport, assay and insure than most real estate or fine art, and companies like GoldMoney make it even simpler and cheaper. Other objections are so ridiculous as to hardly warrant a mention, but I do find it comical that Bloomberg should worry about gold holders suffering from “anxiety” any more than holders of any stock. The issue of confiscation and nationalisation, just like the issue of taxes, is a good reason to keep your gold in a jurisdiction that respects property rights and contracts. However it is certainly simpler to tax or confiscate the assets of a public company than a few coins or bars in a vault somewhere. Gold as an investment protects wealth and property and gives the holder independence and resilience. The real cost of not owning gold is being defenceless and dependent. Not owning gold leaves you completely vulnerable to systemic risk, and leaves you defenceless to government manipulation of the very value of the money that you measure your wealth in. It leaves you exposed to the extreme volatility and uncertainty that characterises today’s markets, as well as to counterparty risk at a time when promises are often not worth the paper that they are not written on. When debtors are not to be trusted, there is a big difference between holding an IOU and cash in hand. That is the value of owning gold. When even “cash” is debt, holding a real asset is immensely superior as a means of protecting your wealth. It is just plain common sense. That this particular asset was officially money a few decades ago is just icing on the cake.